Stonewall Jackson's II Corps engaged Brig. Gen. John Gibbon's Iron Brigade in a fierce confrontation at the tiny of hamlet of Groveton. The ground around Manassas, Virginia was anything but auspicious for Union Army forces in the first two years of the American Civil War. It was there, on July 21, 1861, that a Union army broke to pieces on the bulwark of Brig. Gen. Thomas “Stonewall” Jackson’s brigade, earning the Confederate general his now famous sobriquet. The scene of the first major battle of the war, Manassas was about to become the focus of attention once again. 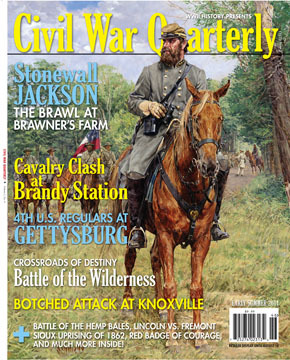 In the Early Summer issue of Civil War Quarterly, you’ll read all about the famous Battle of Brawner’s Farm during the Second Battle of Manassas. Writer John Walker’s feature, “Brawl at Brawner’s Farm,” takes you right alongside Stonewall Jackson’s intense confrontation with Brig. Gen. John Gibbon’s Black Hat Brigade. During the most heated parts of the battle, Jackson’s Confederate column pushed forward to an old fence just 80 yards away from the Union line. Letting loose with a fearsome Rebel yell, they opened fire on the enemy. Did Jackson prevail? And what were the roles of other leaders in the fight, such as Gen. John Pope, Maj. Gen. J.E.B. Stuart and James Longstreet? You’ll read all about them and more inside this Early Summer issue. Determined to hold on to the crucial border states of Kentucky and Missouri, Abraham Lincoln clashed publicly with Maj. Gen. John C. Frémont, the famous “Pathfinder,” over the major general’s hasty emancipation proclamation in Missouri. Outraged by corrupt Indian agents and slow-arriving subsidies, Sioux warriors in Minnesota went on a bloody rampage in the summer of 1862, spreading panic throughout the North already at war. The proud Regulars in Company H, 4th U.S. Infantry, made a gallant stand in the blood-soaked Wheatfield on the second day of the Battle of Gettysburg. A clutch of Confederate Irishmen faced thousands of Federals in the battle for Texas. What do you think of Jackson’s strategy at the Second Battle of Manassas? How capable were Pope and others in thwarting his attacks? Let us know what you think about this and other features in this Civil War Quarterly issue in the comments below. Tags Abraham Lincoln, Battle of Gettysburg, Confederacy, general james longstreet, J.E.B. Stuart, john pope, Sabine Pass, second battle of manassas, Stonewall Jackson, Union Army.